" Civic Center - Denver, Colorado - 1935. " 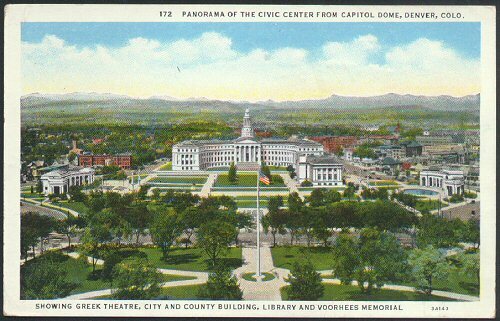 (1641) POSTCARD: Civic Center - Denver, Colorado - 1935. -Condition: Very Good. - Not Posted. View from the Capitoal Dome of Denver. Buildings in view include the Civic Center, Greek theatre, City and County Building, Library and Voorhees Memorial. Back has printed information on the Civic Center. Also has handwritten date of January 19, 1935 with "from Bertha". Was meant for Mrs. C. T. Taylor, although never sent. Price: $3.50 + shipping.